I have to say, I'm enjoying my new Slidekick Slide. I did a bit of research before I got the phone, so I knew what to expect. The screen was going to be great (which it is), the keyboard awful (which it is) - but at the heart of it, the device was a Sidekick and there wasn't going to be a whole heck of a lot of difference between using it and my SK III. And that's basically true - which is a good thing. But here are 5 pleasant surprises I've had from the Sidekick Slide. If you're not a Sidekick user, they probably won't seem like much. But for those who have come to know, and love the Sidekick, you might appreciate these. While I've always found it easy to switch between, say, vibrate and ringing, I've never quite been able to customize the sound on the device enough. For example, I'd love a mode that I can put the phone into before bed that turns off most sounds, yet will still make noise if SMS messages come in (those pesky servers again, no doubt). 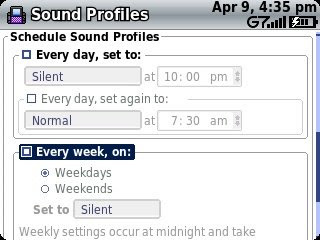 I think this has finally been added - not only can you tweak the different existing sound profiles, but you can also schedule them. I'm far from a gamer. But even I find there are times when I don't want to blog, respond to e-mail, do IM or some other thoughtful activity. To be able to play an easy and fun game would be handy. Asteroids was neither easy nor fun. 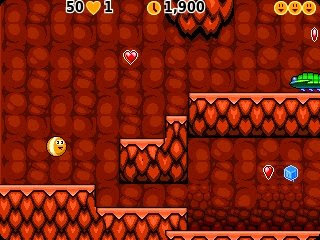 Bob's Journey seems like a sort of Nintendo Super Mario Brother's knock off, which is the only game I ever mastered. So it's nice to have a diversion on the phone that I'll actually use. 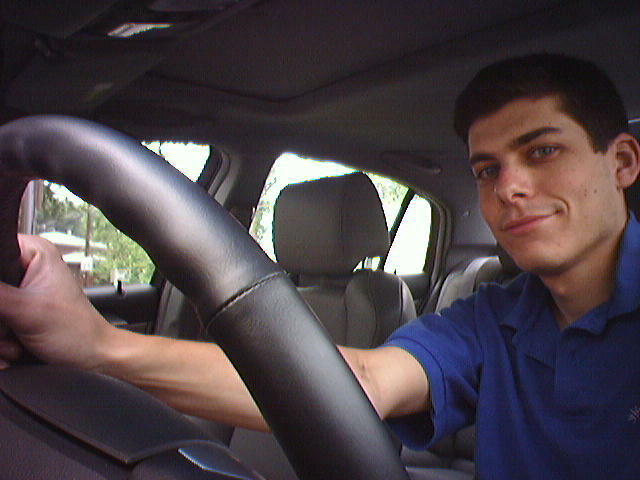 One thing I love about the Sidekick is the ability to navigate among apps very, very quickly. They've made this better by adding two new short cuts: the X key and Circle key together, now bring up this "New Messages" dialog box, and the Circle key plus the letter 0, now jumps you to the first unread message. This means that a message can come in, you can check it, regardless of whether it's E-mail, MMS or SMS, and then jump right to it. All with just a few keys. In fact, you can keep hitting Circle + 0 to keep reading new messages. I suppose this is the emacs geek in me coming out with this one. I knew MMS was going to be included in the Slide (whoo! ), but I was surprised that it so easily allowed you to record audio content. 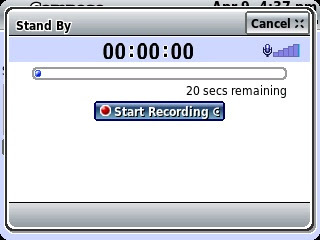 It limits you to 20 seconds of audio. This feature has hack written all over it. I so need to start www.sayitin20.com, a sort of audio version of twitter, where all your postings need to be audio clips of less than 20 seconds. Or maybe veryshortpoetry.com? Like I said, lots of possibilities here. The device can now be charged via USB. This one is probably the nicest surprise of all. No more worrying about leaving the adapter at home, or in the hotel room. I can always replace it with a cheap USB cable. And as a bonus, I don't need to carry around two cables - one for charging and one for data. Did I miss anything that pleasantly surprised you? Besides the keyboard, what else don't you like about the phone? hey, i have a sidekick but i can't figure out how to get to the recording part. 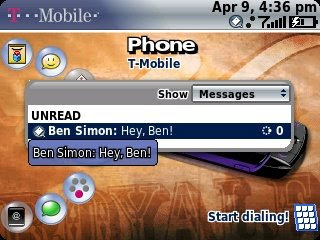 You need to compose an MMS (not SMS or e-mail message) and then click on the microphone button. yes, thank you. do you have any idea how to record audio and set it as your ringtone? Anthony - Sorry, I don't know of a way to turn a voice clip into a ringtone. I have a Sidekick, but what I don't like about it is that you can't set your own ringtones. To apply your recording as a ringtone you need to click onto the phone image..Then click the top left button of the phone..scroll down to settings... General..incoming call ringtone.. imported.. and it should have all your recordings there!